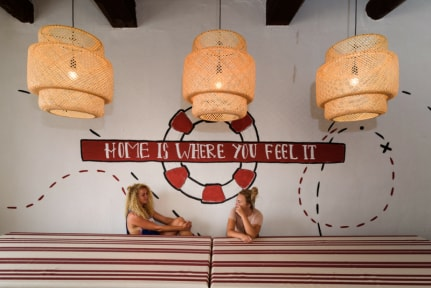 Suntrap Hostel i Lagos, Portugal: Reservér nu! 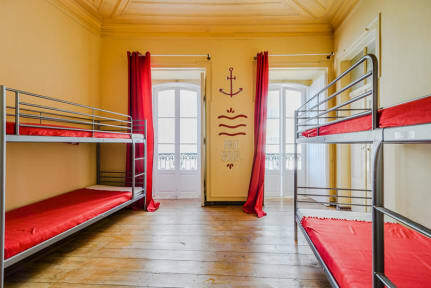 This year a century old Portuguese townhouse has been renovated and re energised resulting in Suntrap Hostel. With 2 rooftop terraces, 3 meter high ceilings, floor to ceiling windows looking out on to the bustling Lagos street below and a common room big enough for everyone to enjoy. Furthermore, we have some common areas and amenities such as 2 great roof terraces where you can sunbathe, socialise or enjoy a great meal, Wifi all across the hostel, books and games available in the living room and an equipped communal kitchen where you can make you own meal, have a coffe or tea. Our location is magnificent. We are in one of the most relevant areas of Lagos, really close to some of the most inserting tourist attractions such as Armazém Regimental, Lagos Stairs Playa and Praia Dona Ana, amongst other important tourist landmarks of the city. In addition, the town of Sagres is just 30 minutes away by car, meanwhile Faro is around one hour away by car. We offer several room types that will suit and satisfy the needs of any travellers. In addition, we offer some common areas in which the travellers and guests will be able to get together and speak about past experiences and future plans. Come and stay with us at Suntrap Hostel while you explore and experience everything Lagos has to offer. Check out from 08:00 to 12:30 . We had a lovey stay at suntrap hostel. We were the only guests at the hostel, since we visited out of season. The owner brought dinner for us and we ate it at the rooftop terrace, we had so much fun, the owner told us so many great and funny stories. Sadly we only spend one night.. I would definitely recommend this hostel, especially if you go during the summer!